Tibbalds CampbellReith was appointed by Basingstoke and Deane Borough Council and Hampshire County Council as masterplanners and planning consultant to secure Outline Planning for a residential-led development of 3,200 homes and ancillary uses, such as mixed-use centres, schools and open spaces. Campbell Reith provided technical support and prepared and coordinated the EIA with the wider project team. The site on the western side of Basingstoke covers an area of approximately 320 hectares, of which approximately 100 hectares is to be provided as a Country Park. The reminder of the site will be developed for 3,200 homes, primary and secondary schools, local centres and additional community facilities. 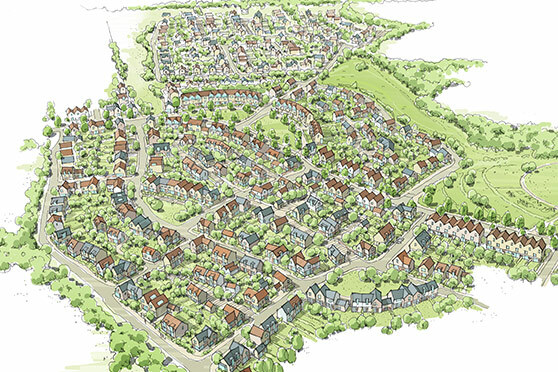 Manydown will form a new neighbourhood at the western edge of Basingstoke. It is based around the TCPA’s Garden Settlement principles and will not be an isolated development, but designed to become an integral part of the wider town and contain all elements that make neighbourhoods liveable. North Hampshire has a rich and interesting history and contains towns and villages with strong distinctive character. The proposals for Manydown are influenced by a variety of the existing characteristics, such as development form and block structure, building types and rhythms, materials and landscape. The masterplan for the site has been developed through a comprehensive engagement strategy that includes local population, school children, stakeholder, elected Members, technical consultants and Local Authority officers. The process kicked off with an intensive engagement period in November 2015 when over 400 people joined the discussions and provided comments and input. This period of engagement helped to define initial masterplan approaches. The application has been submitted and is expected to go to committee during 2018.